Sorry to burst your bubble but you’re not going to be able to use SB Game Hacker without rooting your phone. The reason is that this app needs to access certain areas of our operating system that are essential to modify parameters of any app. And that’s precisely what SB Game Hacker does: it modifies certain aspects that are natively blocked on the operating system because we don’t have super user permissions. Those permissions or, in other words, being a root user are required to be able to have full control over the system. In this case, this application, as you already know, can be used to alter the numerical value of different games such as those that internally refer to the health of your character or your coins, which will allow you to purchase improvements without having to pay any real-life money. Don’t be fooled by the long list of tutorials that you’ll find on the Internet, some of them on YouTube, that explain how to install SB Game Hacker without rooting your device. They send you to Aptoide and other similar alternative stores, and tell you a story so that you end up watching the video in question but at the end of the day, they don’t solve the problem. So, to sum up, you’re going to need to root your smartphone or tablet. If you finally decide to do so (carefully read all the drawbacks of rooting a phone), the best thing you can do is to find a method that isn’t too tiresome. 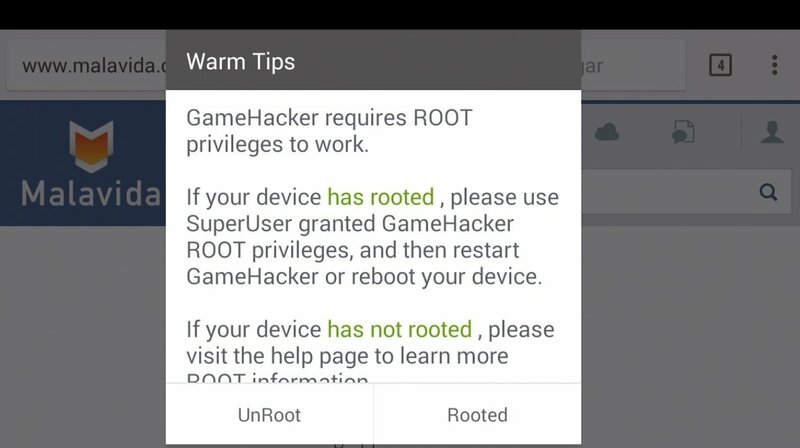 For instance, with applications that can carry out this operation without needing to resort to a PC: KingoRoot, Framaroot, Towelroot… the rooting process will be carried out from the device itself without USB cables or any other external elements.